Above: A young hop bine at the Braunius hop farm in Mt. Vision, where farmers and brewers got a chance to tour a working hop farm and taste local micro-brewed beer over the weekend. Photo by J.N. Urbanski. This year, New York State passed the so-called "Farm Brewery Law" to allow for the issue of a new Farm Brewery License. Supported by New York State Senator David Valesky, it's designed to provide an incentive for farmers to grow hops and other agricultural products associated with the production of craft beers and cider. Modeled after New York State's highly successful Farm Winery License, the new farm brewery license is intended to create new opportunities for farmers, spur economic development and bolster the state's thriving agrotourism industry. With the new license, farmers can sell beer from a farm if 20 percent of the hops in the final product and 20 percent of the other ingredients (barley, wheat, yeast) were grown in New York State. The percentage is low now, to give the local hops farming industry a chance to flourish, but will rise each year until it reaches 90 percent. License holders can sell their products directly to consumers for consumption on or off the premises, and conduct beer tastings at the licensed location. Needless to say, the new bill has caused some excitement in both the farming and brewing communities, and a flurry of sponsored events on farms throughout the state designed to spread the word. The race is on to find interested farmers and to bring brewers, processors and hop growers together. On Saturday, August 18, about 150 farmers and brewers gathered at an event at the Braunius Hop Farm in Mt. Vision, near Oneonta. Sponsored by Cornell University Cooperative Extension and the Northeast Hop Alliance, the event included a pre-harvest hop tour, picnic and beer-tasting set up by four local beer companies: Saranac, Ommegang, Butternuts and Cooperstown. Attendees were split into groups and given a tour and lecture on growing hops from Steve Miller, hops specialist at Cornell University, and hop growers Bill and John Braunius. According to the speakers, a century ago, New York State was the largest hop growing area in the country. Today, American hops are grown mostly in Washington and Oregon. "Otsego County was once the country's "hops central'," said Bill Braunius. Miller said that the revival of interest in microbrewing is spurring more local interest in hop farming. "We have so many microbreweries now that there's great interest in having local hops used in local brewing. We're up to about 75 hops growers in the state," said Miller. "It's going to add greatly to the economy, because there's the whole aspect of not only growing hops, but growing barley and wheat which is very specialized, as well as the number of jobs involved in the breweries. If we look at the number of people that come to the state to go to farm wineries, we're expecting that sort of tourism at farm breweries." The new industry is also looking for cuttings of native wild hops in the area, some of which were probably left over from Prohibition and may be especially resistant to pests and disease. If you're a landowner who has wild hops growing on your property, you're invited to go to the Geohopping website, where Cornell Cooperative Extension and the Northeast Hop Alliance are tracking reports of "feral" hops. Below: Steve Miller, who was recently hired as Cornell Cooperative Extension's first hops specialist, at the Braunius Farm. Tall hop poles can be seen in the background. Photo by J.N. Urbanski. 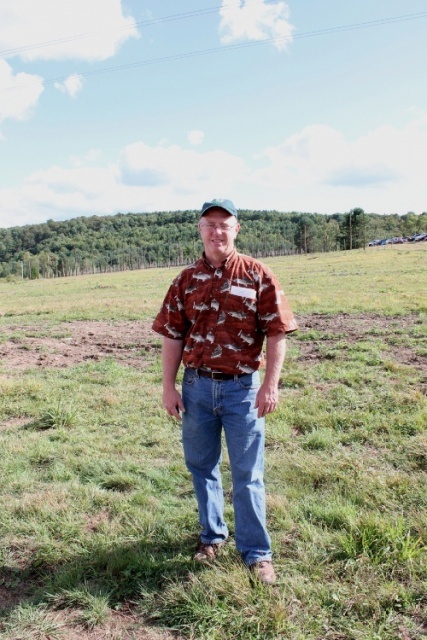 Correction: Due to an editing error, an earlier draft of this story stated that the Farm Winery License program in New York State was created in 2011. The program was amended by legislation last year, but it has been in place since 1976. Apologies for the error.